What is a critique? 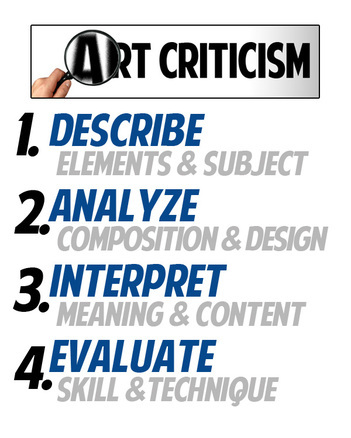 A critique is an oral or written discussion strategy used to analyze, describe, and interpret works of art. Critiques help students hone their persuasive oral and writing, information-gathering, and justification skills. Part of the critique process is recording information about the artwork and artist. This is called the credit line. It includes the artwork title, the artist, the year it was created, it's dimensions, and sometimes where it resides. 1. Name of the artist. 2. Title of the work. This always appears in italics. 3. Year the work was created. Sometimes, in the case of older works, "c" appears before the year. This is an abbreviation for circa, a Latin word meaning "about" or "around". 4. Medium used by the artist. This is the material used to make art. If more than one medium is used, the credit line may read "mixed media". 5. Size of the work. The first number is always the height, the second number is the width, and if the work is three-dimensional, the third number indicates the depth. 6. Location of the work. The location names the gallery, museum, or collection in which the work is housed and the city, state, and country. The names of the donors may also be included. What kinds of things do you see in this painting? What words would you use to describe this painting? What other words might we use? How would you describe the lines in this picture? The shapes? The colors? What does this painting show? Look at this painting for a moment. What observations can you make about it? How would you describe this painting to a person who could not see it? How would you describe the people in this picture? Are they like you or different? 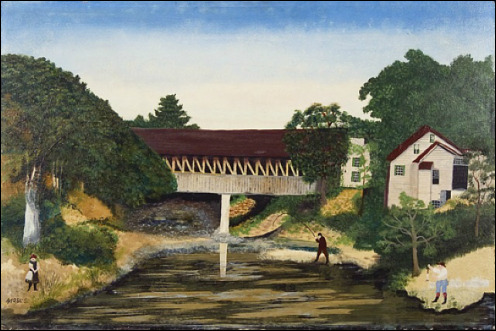 How would you describe (the place depicted in) this painting? What type of balance does the artist use (Symmetrical, Asymmetrical, Radial)? Describe some areas in the work that contrast each other (big/small, plain/patterned, bright/dull, thick/thin, etc.). Do all the parts fit well together creating a sense of unity? If so, give several examples. If not, what stands out as not belonging? Are there any patterns in the design? What is going on in the artwork? What evidence did you see that lead you to this conclusion? What do you feel as you study the image? Describe the expressive qualities you find in the work. What expressive language would you use to describe the qualities (i.e., tragic, ugly, funny)? Do you like this piece? WHY or WHY NOT? What is the best part of this artwork? What is the worst part of this artwork?